Found 2 file extension associations related to Peachtree Complete Accounting and 2 file formats developed specifically for use with Peachtree Complete Accounting. 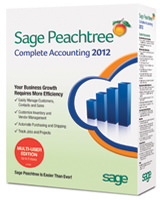 Sage Peachtree Complete Accounting provides easy-to-use tools for your expanding business needs. It contains all the features found in Sage Peachtree Pro Accounting, plus in-depth inventory and job costing capabilities, online bank reconciliation1, electronic bill pay2, 100+ customizable reports, and a multi-user version3 for increased productivity. The Peachtree Complete Accounting software seems to be old or discontinued. If you need more information please contact the developers of Peachtree Complete Accounting (The Sage Group plc), or check out their product website.